As the sun sets, leaving behind golden hues in the dark sky, I am eager to go home… Go home to my two special men who complete my life and make it so much happier and fun to live! As soon as we step inside our home, we are greeted by our pure white kitchen dotted with splashes of reds and greens here and there. We slip off our shoes and tread through glossy ceramic tiles, feeling the cold that seeps from the floor… at the other end of the kitchen is our little wooden dining table, with mismatched chairs with soft cushions. Underneath the table is soft, deep, colourful rug and we gratefully sinking our cold feet into it, drawing its warmth and softness! This is where we sit, talking about our day and sipping hot, creamy coffee or warm milk for Lil Dumpling! And then we begin cooking our dinner, sometimes it’s me and some other time it’s HD. While I get busy with chopping the veggies and stirring the pan or pots, Lil Dumpling sits on the floor either stirring the wooden spoon on big plastic containers or putting the lids on assorted containers of different shape and sizes. 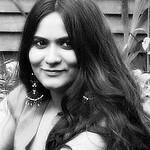 He loves to watch me cooking in the kitchen, the clang of pots and pans and the aroma wafting from sizzling hot curries. He likes the buzz of the busy kitchen and be a part it. I love to watch different emotions play on his face, wonder, curiosity, joy, and sometimes fear too at the unexpected noise like pressure cooker whistle. The sparkle in his eyes as I add colourful ingredients to pot and stir them is going to stay with me till my last breath. Cooking has always been therapeutic to me. These days I spend less time in kitchen, but cooking still rules the list of things I love to do for myself! I have come a long way from the days where I would cook fancy and elaborate meals with complex flavours and ingredients. These days I cook things are simple and yet flavourful. I like to use the ingredients that are packed with nutrition as Lil Dumpling loves to eat what I cook. So I choose the ingredients carefully and introduce him to new flavours, taste, and texture. Grid all the ingredients listed under Palak/Spinach Puree to smooth paste without adding any water. Keep it aside till needed. Heat oil in a pan and add cumin seeds to it. When it starts to sizzle and change colour, add finely chopped onions. Cook till onions turn golden brown, about 2 minutes. Next add button mushrooms and stir fry them till water starts to leave, about 3 minutes. Mix in spinach puree and give it a good mix. Add ½ cup water, garam masala (if using), coriander powder and salt to taste and mix them well. Cover and let it cook for 7-10 minutes. Add little more water if you find the gravy too thick and adjust the seasoning. 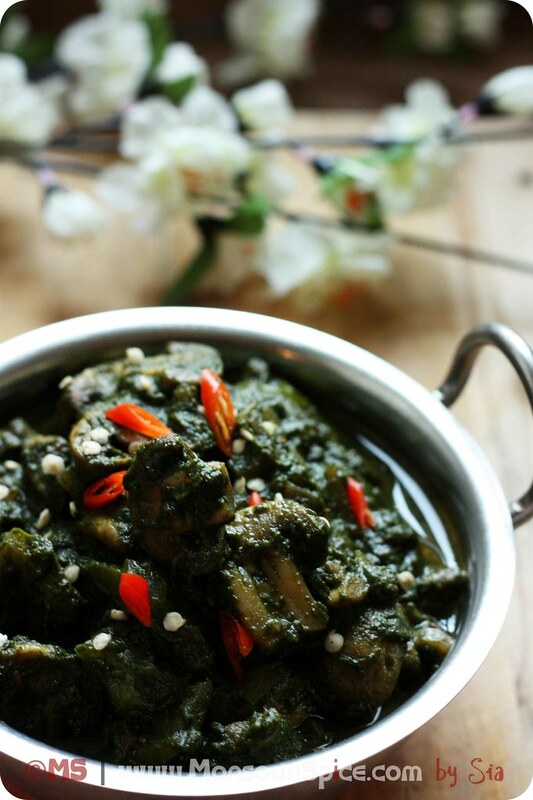 Switch off the gas and add lemon/lime juice to taste and serve this Saag Mushrooms or Palak Mushroom Curry with rice or any Indian flat bread and devour! 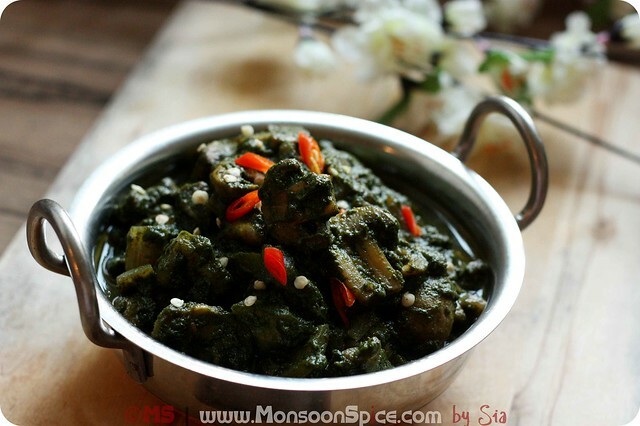 You can also add few mint leaves while grinding the spinach puree for different flavour. You can also add few cashew nuts when making the spinach puree which will not only give smooth texture but also helps in thickening the gravy. 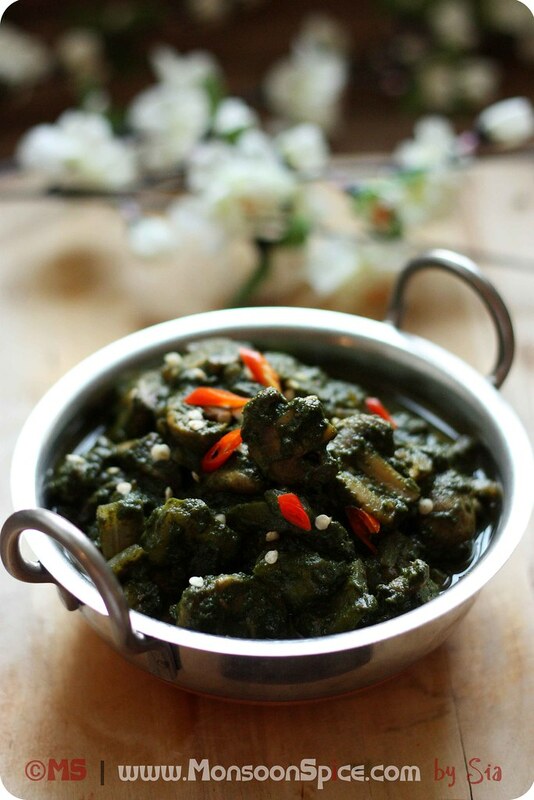 Addition of garam masla is optional as the whole spices are used when preparing the spinach gravy. 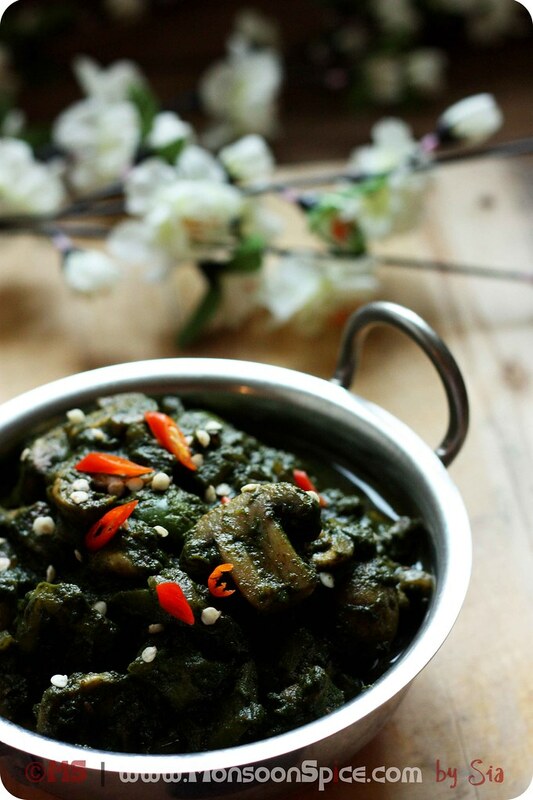 You can substitute mushrooms with Tofu or Paneer or Potatoes (boiled) for different flavours. When cooking for kids, reduce or entirely skip the use of green chillies as the heat from whole spice is enough to lift the flavours. What a great combination! That is a dish I'd love to eat for lunch. Love this recipe! 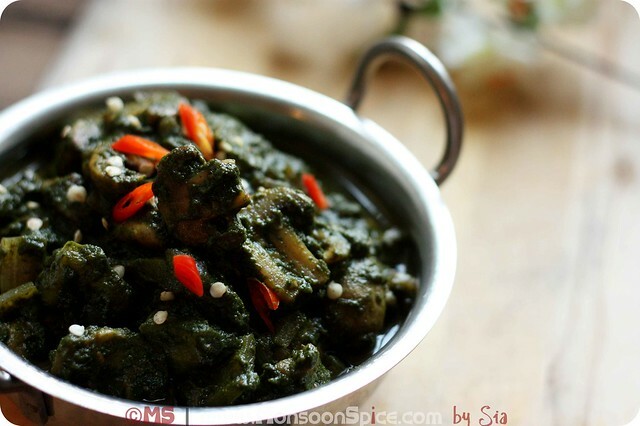 Never really used mushrooms with palak so will make this soon! 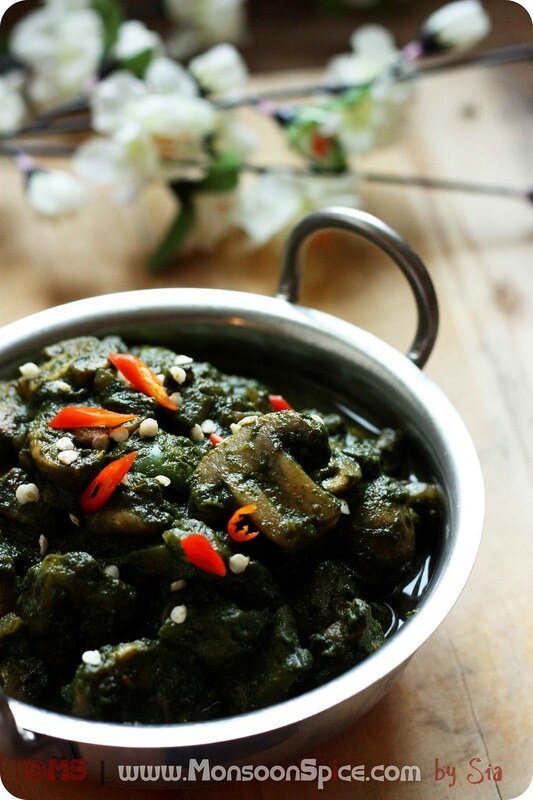 My daughter loves mushrooms so If I skip/reduce the green chilies she will enjoy this gorgeous green curry! This is such a simple wholesome dish! :) and it looks super YUM! Love it! I make something similar with the addition of corn as well, but I like the way you flavor the spinach separately. Makes it extra special. I deifinitely need to give it a try. 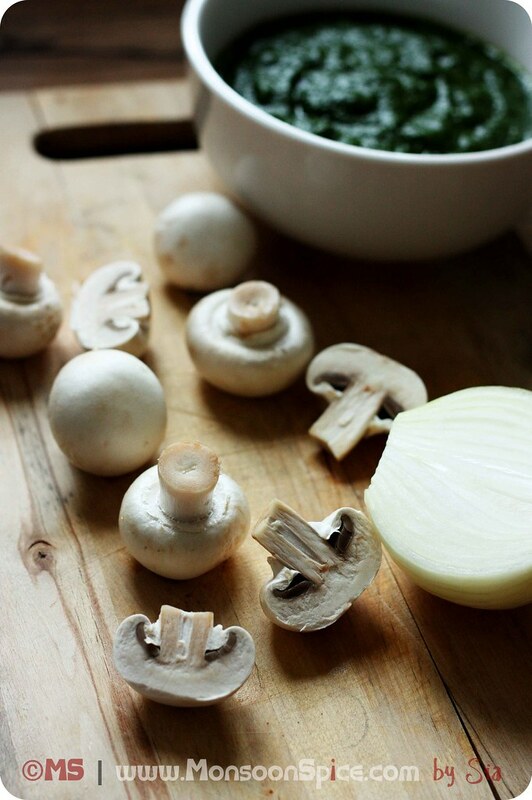 Excellent combination of spinach and mushroom. Just wish I was there to get a taste of it. delicious dear..U have made it perfectly..Love to make this..
you do not pressure cook the spinach first before you grind it in a puree? hmmm in that case, does the spinach cook in 7 -10 minutes? 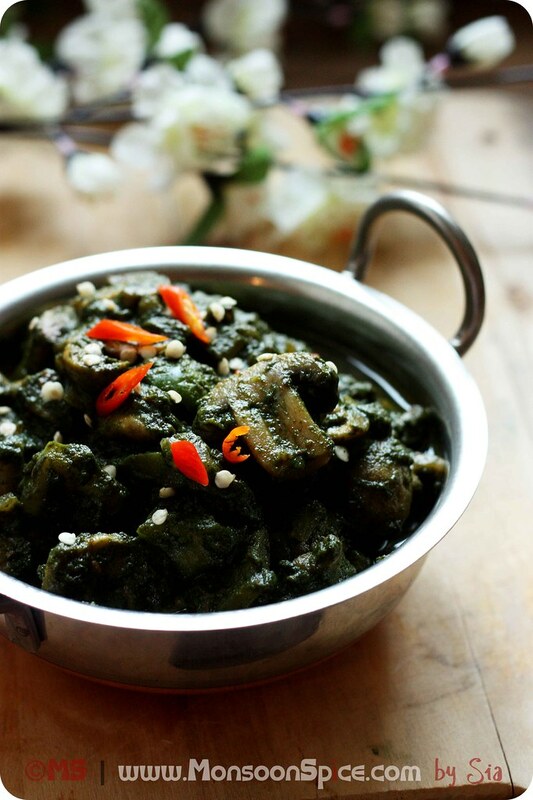 Yes..I love mushrooms and pairing it with palak..Mmm..sounds a lovely idea! Excellent recipe. I followed exactly the same, with the addition of frozen corn kernels. The colors(yellow, green and brown) turned out so beautiful along with the taste. Very refreshing for summers. 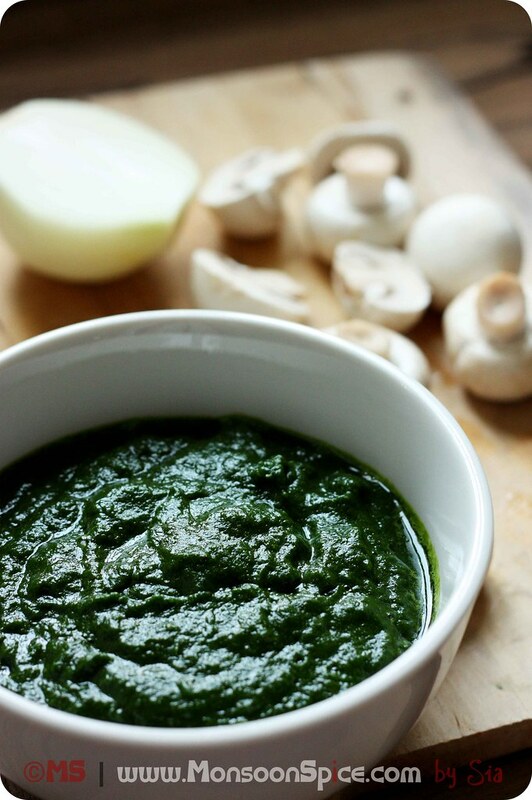 How to mAke the spinach puree? We ate it with steamed rice and dhal and it was delicious!